This fancy Tacoma restaurant is so dedicated to upscale Pacific Northwest seafood that it&apos;s built right over the waters of Commencement Bay. A waterfront window wall gives every guest a view of Puget Sound, the Kitsap Peninsula, and Mt. Rainier from terraced seating areas. 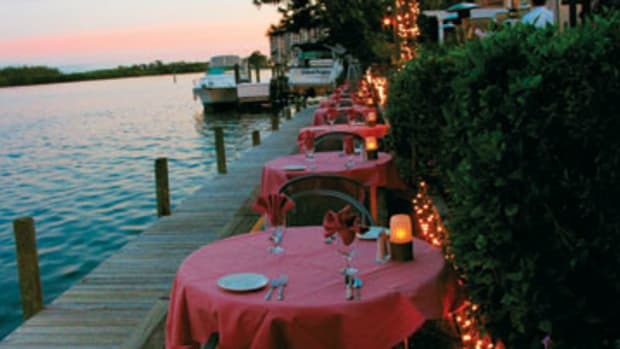 The dock is available from Easter through late September and can accommodate boats to 100 feet LOA; diners can even remain onboard while being served. Opened in 1981, The Lobster Shop remains a local favorite due to superior service and hospitality provided by an experienced staff as well as varying seafood delicacies. As the name suggests, there is also devotion to lobster, specifically from Australia, which is used in the house specialty bisque as well as in the Australian rock lobster tail entree. The Twilight Menu, available Sunday through Friday from 4:30 to 5:30 p.m., is a particular favorite, since customers can choose an appetizer, entree (everything from king salmon to top sirloin), and dessert to feast upon without breaking the bank. To add a little bit of spice to the night, try a vintage wine or a special martini that features a splash of Noilly Prat vermouth to either Bombay Sapphire dry gin or Ketel One vodka.